Even Newport, R.I., claims ancient Viking blood, with its Viking ship weather vane atop City Hall. Stroll west along the Commonwealth Avenue Mall and a monumental curiosity awaits at the far end of Back Bay’s green spine. Standing atop a red sandstone pedestal inscribed with cryptic rune letters is a statue of the Viking explorer Leif Erikson. The youthful bronze figure makes quite the fashion statement with his cascading locks and hip-hugging chain mail coat as he shields his eyes with his left hand to survey modern-day adventurers navigating Boston traffic. The Hub might seem to be a strange place to honor a medieval Icelandic-born adventurer, but for centuries New Englanders have theorized that Erikson led a thriving Viking settlement here around 1000 AD, more than six centuries before the Mayflower set sail. The Back Bay statue is a tangible reminder that perhaps the Pilgrims weren’t the first Europeans to call New England home. So as Thanksgiving approached, I set out to discover the region’s Viking connections, and Erikson’s westward gaze pointed me in the direction of the first stop. Four miles away in Cambridge, tucked into the sod behind Mount Auburn Hospital, is a granite plaque sporting a matter-of-fact declaration that will short-circuit the mind of any stickler for history: “On this spot in the year 1000 Leif Erikson built his house in Vineland.” Don’t remember that fact from history class? It’s for good reason. The marker was erected on flimsy evidence. The man responsible for the plaque, Eben Norton Horsford, a Harvard chemistry professor, was seduced by the theory of a Viking discovery of America that was popularized by Danish scholar Carl Christian Rafn in his 1837 book “Antiquitates Americanae.” Horsford’s invention of double-acting baking powder made him a rich man, and his newfound fortune bankrolled his obsession. After raising money for the Erikson statue, which was unveiled in 1887, he searched for evidence to confirm that New England was the location of the North American outpost of Vinland mentioned in the Norse sagas. If you go in search of Viking artifacts. . . If you go looking for Viking artifacts in New England. Baking powder clearly wasn’t the only concoction of Horsford’s creative mind. In a series of books published in the late 1800s, he detailed a vast system of Norse dams, canals, and wharves along the Charles that he said was the lost city of Norumbega, which had appeared on early European maps of North America. Although he offered no proof, Horsford grabbed headlines and inspired guidebooks that led Gilded Age tourists to the reputed Viking sites. Following an 1893 guidebook with detailed maps and period photographs that I downloaded on my iPad, I find the natural terraced amphitheater straddling Cambridge and Watertown reported to be the gathering place of Viking governments now swallowed up by triple-deckers, although street names such as Ericsson and Thingvalla still maintain a Nordic accent. A granite slab in Cambridge erroneously marks the millennium-old location of explorer Leif Erikson’s house. In Weston’s Norumbega Park, however, I find an enduring monument to Horsford’s speculative history. 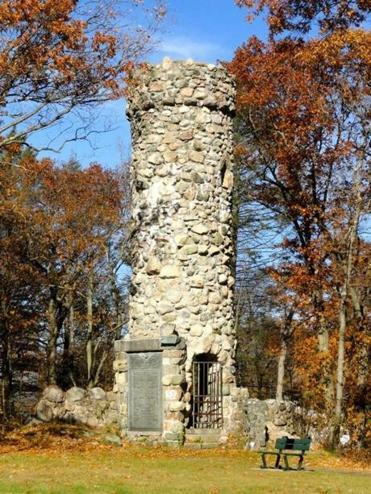 At the confluence of the Charles River and Stony Brook, the baking powder magnate built a stone tower in 1888 to mark what he believed was the site of an ancient Viking citadel, Fort Norumbega. The only evidence Horsford offered were his eyes and ears. He surmised, because of their pronunciations, that “Norumbega” was the ancient Algonquin word for “Norway,” and he believed the topography of the suspected fort location matched that described in the sagas. The enormous tablet embedded in the fieldstone structure asserts that Erikson first made landfall on Cape Cod before discovering the Charles and starting a settlement that traded in fish, fur, and burrs — warty tree outgrowths used to carve religious chalices, tankards, and bowls — until the Vikings inexplicably returned to Iceland in 1347. While a Viking discovery of North America was only theorized in the 19th century, archeologists did unearth evidence of a Norse settlement on the northernmost tip of the island of Newfoundland in 1960. But did the Vikings ever venture down the coast to New England? “There is clear archeological evidence that they went further south, but where and how much no one knows,” says Short, although he believes it probable that Viking-age explorers from Greenland and Iceland reached New England. A statue of Leif Erikson gazed out from Boston’s Commonwealth Mall. While the search for hard evidence goes on, Short and other members of Hurstwic, a Viking-age living history organization, keep the spirit of the Norse adventurers alive with demonstrations of Viking weaponry and daily life. Earlier this month, Hurstwic opened a new training facility in Millbury where members practice the fighting combat moves of the Vikings. Short hopes to use the space to expand the organization’s Viking-related cultural classes and programs. “I’d like to make this the Viking center of New England,” he says. Residents of Newport, R.I., might argue that they are already the Viking center of New England. A golden weather vane in the shape of a Viking longboat topping the cupola of City Hall guides me into Newport, and I walk past the landmark Hotel Viking before coming upon the reason for the city’s Nordic flavor: the mysterious cylindrical Stone Tower dominating Touro Park. The Vikings are among the suspected builders of the mysterious Stone Tower in Newport, Rhode Island. The origin of the roofless fieldstone structure has baffled historians. While the most common theory is that the tower was the base of a windmill belonging to Benedict Arnold, not the notorious traitor but his Colonial governor great-grandfather, scholars have attributed its construction to everyone from the Knights Templar to Chinese explorers to the Vikings. Egan says the tower’s eight-legged base refutes the notion of a Viking construction. “They didn’t deal with arches and pillars. It’s not their style.” With his green laser pointer dancing on the structure’s fieldstones, Egan points out a rock with three faint gouges that proponents of the Viking theory say are runic characters that translate to a construction date of 1150. To our eyes, however, they look like mere scratches. So if the Vikings didn’t build it, then who did? Egan takes me on a whirlwind tour of his voluminous research inside the Newport Tower Museum, which he opened two years ago. With a pointer in hand, he leads me through the museum’s photographs and drawings and a complex theory that touches upon history, geometry, astronomy, optics, numerology, and architecture and has been the basis of his eight books on the tower. The conclusion of his rapid-fire dissertation is that the tower was a celestial clock and giant camera obscura built in the 1580s by English explorers on a reconnaissance mission to start a Roman Catholic settlement using the design of mathematician and astronomer John Dee. Before leaving, Egan tells me of the Narragansett Rune Stone, a large boulder with possible Viking inscriptions now in state custody after being stolen last year from the waters of Narragansett Bay. The mysterious carvings echo Dighton Rock in Berkley, which Rafn said bore the rune lettering of a Norse adventurer, and Thorvald’s Rock at the Tuck Museum in Hampton, N.H., according to legend the gravestone of Erikson’s brother. Whether these rocks are just more monumental follies or proof of New England’s Viking past, we may never know.